Indole-3-Carbinol (I3C), What is Indole-3-Carbinol, What is it made from, what other names does it have. Indole-3-Carbinol, also known as I3C, is found in cruciferous vegetables such as collards, mustard greens, turnips, cabbage, broccoli, kale, cabbage, cauliflower and Brussels sprouts. Cruciferous vegetables are recognized as being one of world’s healthiest food sources, providing multiple nutrients and anti-cancer properties. 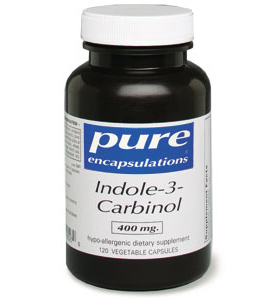 Research has shown that Indole-3-Carbinol supports a hormonal balance as it prevents cellular damage thus also benefiting the body’s immune system. Indole-3-Carbinol is produced by the breakdown of glucosinolate glucobrassicin (found in cruciferous vegetables) and is then transformed to diindolylmethane in the stomach. The substance that is found in the bloodstream after ingestion is not Indole-3-Carbinol, but is actually diindolymethane. The breakthrough of creating Indole-3-Carbinol as a supplement was due to the simple revelation that people with a diet high in vegetables and fruit had a lower chance of having poor health. Trials are being conducted to determine the authenticity of consuming Indole-3-Carbinol supplements to prevent illnesses, particularly cancer. Although it does not provide an active cure to cancer, Indole-3-Carbinol is scientifically proven to support the health of reproductive organs and cellular reproduction for both men and women. It also assists in detoxifying the intestines and liver.As an antioxidant, it stimulates the production of enzymes that detoxify toxins and protects cell structures including DNA. Lycopene is another vegetable antioxidant with proven health benefits.With possible anti-carcinogenic, antioxidant and anti-atherogenic effects, this vegetable component is only just being acknowledged as a solution to a variety of health issues Indole-3-Carbinol is currently being clinically researched as a cancer preventive agent by the National Institutes of Health.